Here is the toy censer you have all been looking for! Now available with detachable bells. 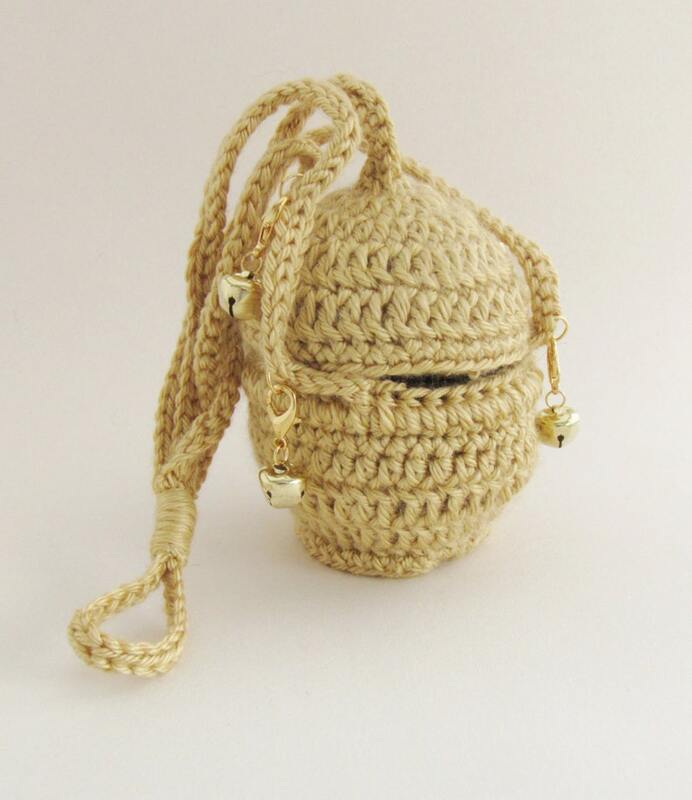 This unique item is hand-crocheted and both durable and child-friendly. Gold-colored yarn is crocheted around foam hemispheres to hold the shape. The "chains" are crocheted and have minimal stretch. They come together at the top to form a loop convenient for hanging. Six gold rings are stitched in place at regular intervals. Six bells are attached to the rings with lobster claw clasps and may be removed as desired. The censer is constructed such that a one-inch space exists between the top and bottom halves. This allows the felted "charcoal" (made from black wool) to be inserted or removed. Many, many other items such as priest, monk, and nun Waldorf-style dolls, baby knits, holiday decor, miniatures, bags, accessories, toys, etc. are also available exclusively from cozyhousecurios.com. Visit me there! Thank you again! We surprised a 3 year old who wants to be a Deacon with this censer one Sunday morning. We had every intention of waiting until after Liturgy to give him the beautifully wrapped present (right from the box, thank you!). But, the little Deacon had smuggled in a large metal chain that joyfully clanged around the quiet church. I don't know who was happier, the boy or his grateful mother! It has been about two months and the censer still goes everywhere with him- to church, to the playground, ect. Thank you for another wonderful product! Thank you so much for this amazing censer! Our son is so happy we got him this gift, he blesses the house everyday. It’s very well made, amazing idea, ideal quality! We love it! Thank you so much again! Absolutely perfect! My toddler son hasn't put it down since Christmas morning, and insists on bringing it to every Church service we attend, and keeps it in his own little prayer corner every night. For custom items priced $75 and above, a 50% down payment will be required before work will be started. This will be accomplished by the customer purchasing a special custom listing (including specific description) for 50% of the price of the item, not including shipping. The remaining 50% and any shipping charges will be due upon completion of the item. A second custom listing will be created with photographs of the item for the customer to purchase. If when I ship your item I find that the shipping is greater than $1.00 less than expected, I will refund your shipping overage, rounded to the nearest $1.00. I ship via USPS first class mail. If you need something shipped in a hurry, contact me and I will research shipping costs. Ordinarily I will be able to ship something already made within the next business day. If I am on vacation I will put an announcement to that end on the shop wall. As a general rule I will not include a paper receipt in the package with your item(s). I think Etsy does a great job of emailing receipts and I like to save paper and ink. However, if you desire a paper receipt included with your package, please leave me a note to that effect when you place your order and I will be happy to do it.